Vihara Innovation Network (VIN), Embassy of the Kingdom of the Netherlands, Startup Tunnel, NASSCOM 10000 Startups announced an important partnership, that will, for the first time include, a collaborative effort between the organisations to conduct an healthcare focused hackathon. Healthcare in remote areas of the country is often impaired due to lack of reach and implementation of services. The mission of this hackathon is primarily to solve that problem, or at least initiate solutioneering. 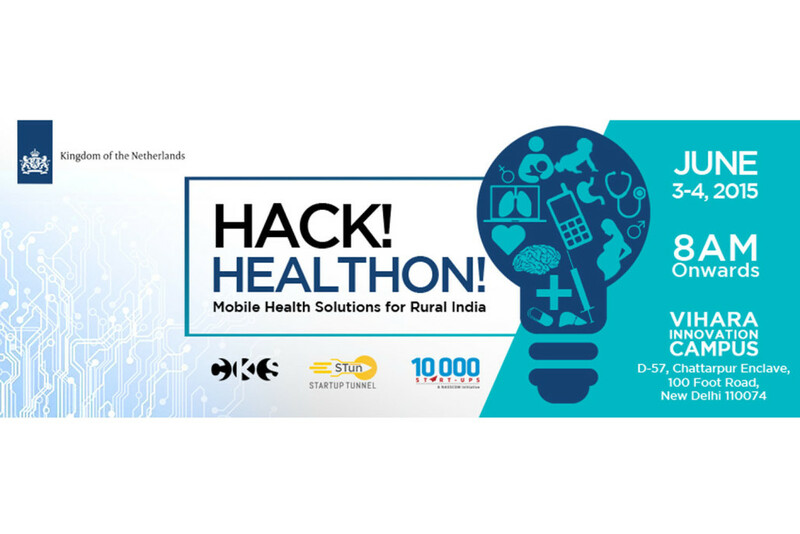 Therefore, The 36 hour Hack is aimed at building mobile healthcare solutions for rural india. The VIN and Embassy led initiative is also been jointly supported by our other key partners Philips, UNFPA, Persistent, DSM, Manipal Hospitals, Maastricht UMC. The endeavor has also seen support from other partners who came forward in active support of the identified problems in Maternal and child healthcare, Nutrition, Diagnostics and Immunization. The hackathon will see 5 key challenges, articulated by AIMS, Philips, Bihar Innovation Lab, Civic Innovation Lab, NASSCOM 10K Startups and UNFPA. A carefully selected team of mentors and experts will be empanelled to address these challenges with the team of android developers, medtech professionals and healthcare professionals over the span of 2 days. Day 1 and Day 2 of the hack will witness intense programming, including pitch presentations with mentors, medtech professionals and investors. On Day 3 in the attendance of the Dutch Prime Minister, Mark Rutte, the award ceremony will take place where the top prizes will include a trip to the Netherlands along with a funded opportunity to develop your app further. The winning team will be entitled to get a Trip to Netherlands and INR 200000 to develop the winning idea further, amongst other internship and mentorship opportunities. Below is your complete guide to what a Hackthon is and what can you expect from a Health Hackathon. If you are an android based programmer, a healthcare professional, a coding enthusiast, a techie, or a med tech professional interested to participate in Hack-Health On!, click here to register for your participation. programmers, and these teams subsequently are given a well-defined and tangible social challenge to which they should find a solution in less than 48 hours. This limited timeframe, the element of competition, and the diverse makeup of the participants often results in surprising and innovative solutions. Why healthcare in rural areas? India has been on the path of considerable progress concerning the improvement of rural health care, both in terms of quality and accessibility. While these strategies have brought more people to receive adequate healthcare, is has also brought to forefront deficiencies in the existing care provision mechanism of the health ecosystem. The need for innovation of health is important to not just save lives but also ensure a better quality of services. People can better access these services through different possibilities of design, mobile-tech, medical-tech, iterative hacking and rapid prototyping that impacts awareness and leads to self-health tracking and mobilization. of June 2015, at the Embassy of the Kingdom of the Netherlands in New Delhi, where the Prime Minister of the Netherlands will hand over an award to the winners. Who can participate and what are we looking for? Programmers and developers. We are ideally looking towards programmers and developers who have experience in the field of e-health, although programmers and developers from outside the field and who are willing to work on health-related solutions are more than welcome. As a deliverable, we can ensure programmers and developers a platform on which they can show their talents to high profile organisations. the award ceremony with the Prime Minister. Impact Investors. who are willing to listen to the initial, intermittent and final pitch presentations during the hackathon and subsequently offer advice or/and display interest to help the programmers develop their concepts further. Register here to participate in the Hackathon or write to us at outreach@adianta.org to know more! © 2017 Startup Tunnel. All rights reserved.